SIFTS (Structure Integration with Function, Taxonomy and Sequences) is a database of residue-level mappings between UniProt protein sequences, and protein structures found in the PDB. The database is updated for each PDB release, and is provided by the PDBe at EMBL-EBI. When Jalview imports PDB data for a protein sequence found in UniProt, either via the 'View 3D Structure...' option, or the 'Fetch DB Refs' web services menu, Jalview will also download its SIFTS record and use that information to construct a mapping between the sequence and downloaded structure. If, for some reason, no SIFTS mapping data exists, then Jalview will generate a mapping using the built-in Needleman and Wunsch global alignment algorithm. This is how sequence-structure mappings were created before version 2.10. Configuration options controlling whether SIFTS mappings are used can be found in the Tools → Preferences → Structure tab, under 'Sequence ↔ Structure method'. Note: Changing the configuration will only affect how new mappings are created. In order to recompute mappings for structures already loaded, please reload the sequence & structural data. SIFTS gives Jalview the ability to display multi-chain mappings between UniProt sequences and PDB structure data. This is important when working with multimeric proteins, when the biological assembly can contain several structures for the same protein sequence. Multi-chain mapping allows all residues in a structure to be located in the alignment, and also, when shading the structure by sequence colours, enables conservation patterns between oligomer interfaces to be explored. To see this in action, Retrieve the UniProt sequence FER1_MAIZE, and then view one of its structures: 3B2F. Mousing over the sequence results to two positions being highlighted in the structure, and colouring the alignment transfers the color to all the mapped chains in the structure. The mapping provided by the SIFTS record is accessible via File → View mapping menu of the structure viewers. 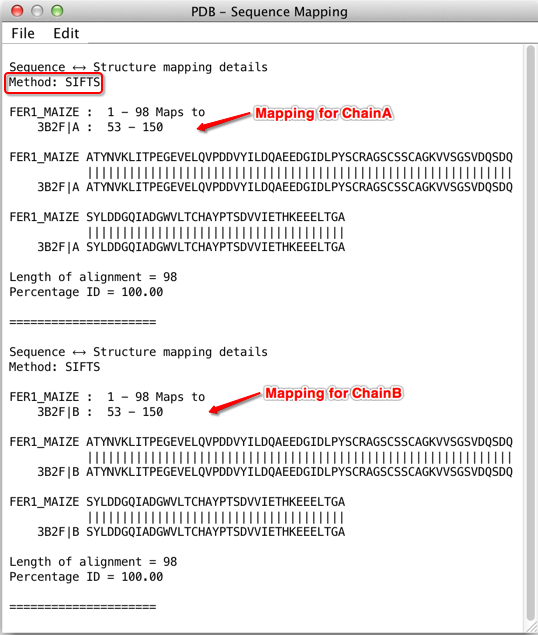 The screenshot below shows the mapping created between UniProt sequence FER1_MAIZE and proteins in PDB 3B2F, which reports mappings for two chains. The mapping method is also reported (highlighted with red border).